Friday, February 18th at 8:42 AM, that’s when I first learned about the mouflon. We had just picked up our jeep for some off road adventures from the small store in Lanai City, and were heading towards the first trail of the day. As we were driving along, I took note of the safety precautions. Among some of the more comical were the warnings that drivers should give way to mouflons. That’s fine, except prior to that morning, I had no idea that such a creature existed. Luckily, we live in an age where information is just a few clicks away, and the small genie inside my iPhone quickly returned a full description of the strange animal, which now calls Lanai its home. According to the description, a mouflon is: a subspecies group of the wild sheep, usually found in Eastern Europe. Concise, but not at all helpful. That was a new one for me. Birds, fine; axis deer, sure why not, but a small version of the mountain sheep? It was my second trip to Lanai, and I was there at the invitation of the Lanai Visitors Bureau, but none of the information I had ever read mentioned this strange quirk of wildlife. Of course if there was potential to witness an elusive and probably adorable animal in the wild, we had to find it. From that moment on, the subtext to our off road adventures was the search of the mouflon. We drove all over the island, from dusty roads leading down to the secluded Polihoe Beach, all the way to Kaiolohia in search of ancient, Hawaiian petroglyphs. By the end of the day, we were hot, dusty and tired, but also empty-handed. Not a single mouflon had been sighted. Disappointed, we reluctantly turned over the keys to the lady at the rental place, who was a little confused when I started complaining about false mouflon advertising. Over the course of the next couple of days on the tiny island of Lanai, the mouflon seemed to be haunting me. During lunch at the Blue Ginger Café, I looked up and there was a photo of an adolescent mouflon staring down at me, mocking me with its soul piercing eyes. Walking through the Lanai Art Center, I was perusing the displays when I turned a corner to be confronted with artwork all directly or indirectly inspired by the mighty mouflon. Without realizing it, I had became Ahab and this small, mountain goat had become my great whale. My angst was somewhat lessened after talking with Lanai residents about the mysterious super sheep; as it turns out most of them had never seen one either. But it didn’t matter, I was motivated and I WOULD find the glorious ungulate. I was stuck though, somewhat literally. Most of our time was accounted for during our week long stay, and another Jeep rental was not on the itinerary. I had almost given up hope when, while thumbing through some brochures I found it, the Koloiki Ridge hiking trail. Among many other natural wonders and unique wildlife watching opportunities, the brochure said that the hike affords the intrepid hiker unique opportunities to perhaps, maybe, if you are lucky, find the reclusive mountain mammal otherwise known as the mouflon. Finally, I had my chance. The day before our scheduled departure from the gorgeous island of Lanai, Scott decided to play golf in the morning. Knowing that the round would take more than half the day, I decided to find the Koloiki Ridge and with it, my furry nemesis. The hike was a good one, if not intense. 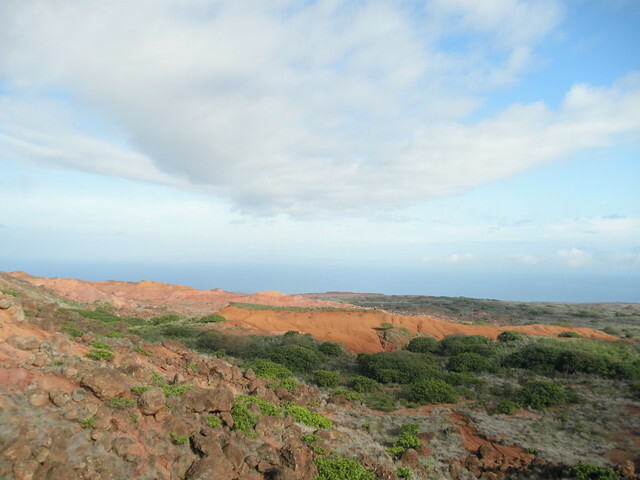 I’ll devote a separate post to it, but it was five miles of arduous hiking in the hinterlands of Lanai. Finally, as I approached the end of the hike at the Maunalei gulch, I came upon a rocky outcrop at the top of a steep ridge. Drawing upon my two whole days of mouflon research, I decided that this was a likely hiding spot for my friends. While motivated, I’m also not stupid and decided to stay on the well marked trail. Until I decided not to, that is. 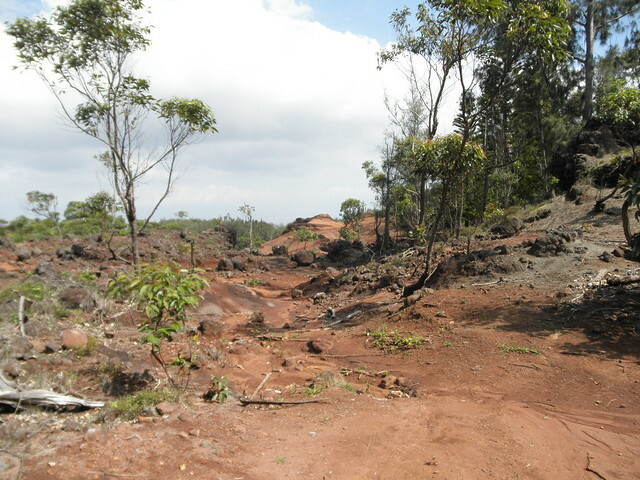 I noticed a small path that led deeper into the barren, rocky area and I had to follow it. I had only gone a few paces from the main trail when I heard a rustle in the shrubs to my left. Now, I like nature, and I like being outside, but I wouldn’t say that I’m an outdoorsy type of person. I’m also somewhat accident prone and was suddenly beginning to wonder if hiking several miles in the Lanai wilderness, where not even a cell signal reached, was actually a good idea. Before I could engage panic mode though, a blur of brown fur suddenly erupted from the trees and stopped about 50 yards away from me. “Holy crap!” I actually yelled, prompting the new found animals to run another 50 yards further away. Mutual of Omaha this wasn’t. But once I got my wits around me, I stood gaping at the scene, in front of me stood four, adolescent mouflon. That’s right, with absolutely no knowledge of the animal or my surroundings and after basing my search solely on the fact that the rocks “looked like mouflon rocks,” I had actually achieved my goal and found the mouflon. I honestly almost started weeping from sheer joy when another thought struck, I had to record this. Would anyone believe me if I said I had found not one, but four mouflons? Surely most would think that I had confused them with an axis deer, pat me on the head and quietly snicker about the silly tourist. I had my pocket camera in hand, and slowly started to take photos. The mouflon were still fairly far away though and I needed my big camera, one that could guarantee a close up shot. Having been in with the mouflon for all of 45 seconds, I noticed two things. They were incredibly fast and almost literally scared of their own shadow. In what seemed like an eternity, I managed to get the camera out of the backpack, go through what felt like a thousand motions to get it ready for use and started to click away. I couldn’t believe what I was seeing, they weren’t moving and instead they were all staring intently at me. A little too intently actually. While these moody quadrupeds were sans horns, I knew that the adult males had mighty ramming machines atop their crania and would probably not hesitate to teach me a lesson. Casting all fear aside though, more interested in getting a better shot, I slowly, almost comically, began to approach. I would take a few steps, stop, take photos and repeat. After two cycles of this though, the lead mouflon decided to bolt, taking his friends with him. I had spooked them, but not before I could at least photograph my great find in the Hawaiian wilderness. The rest of the hike is a bit of a blur. I was on a total mouflon high, hardly able to believe that I had actually managed to achieve my fauna finding mission. 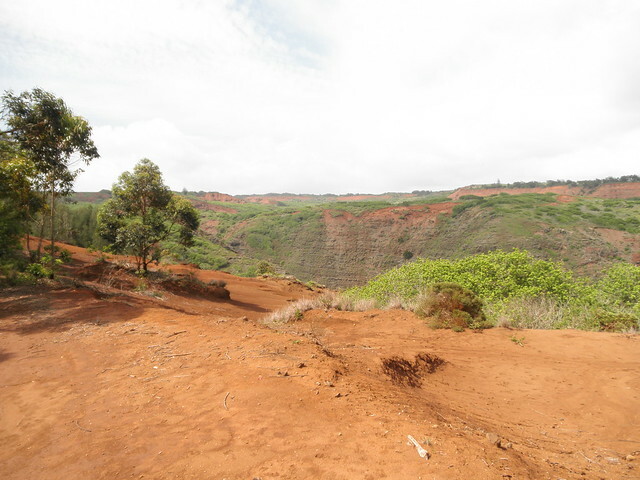 More than anything else, even the most elaborate of meals or well planned activities, this moment of shear joy at finding one of nature’s wonders propelled my admiration of Lanai into a full fledged love affair. I talked about the idea on an old episode snorkeling with the honu (turtles). 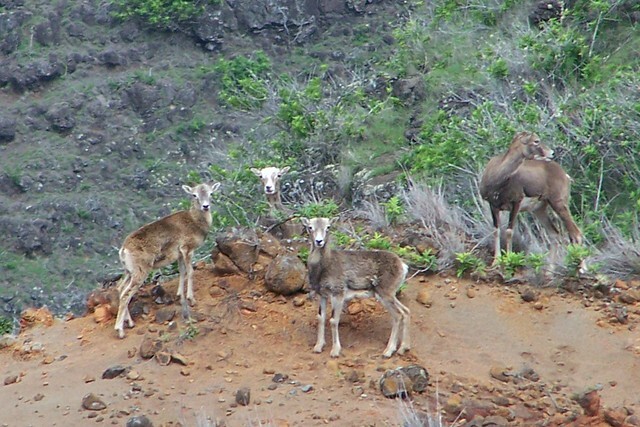 Oh, I will SO be searching for the mouflon on our Koloiki Ridge hike next week! They were totally not on my radar on last visit to Lanai — thanks to you, Matt, and your fine re-telling of your Ahab-like quest, I’m on it this time. LOL, good! It’s a fantastic hike in its own right, the views at the end are stunning. We found some while hiking on the Big Island, and hiked up P’uu Wa’a Wa’a…your hike looks much more beautiful than mine, which felt like hiking in the middle of the desert! Pretty cool stuff! Hawaii is definitely a fascinating place. The hike I did was interesting: the first part was deciduous forest, then desert-like with rock outcroppings and then mountainous. Amazing how many areas exist in such a small area. Ha, you are welcome. And you’re right, I am absolutely drawn to the wildlife of any place I visit. Looks like a really cool hike….great that you got a “mouflon high”! Nice photos. Amazing how animals camouflage themselves, isn’t it?